On the 7th August 1942 Marion Patterson was decorated for bravery by being awarded the George Medal for rescuing a serviceman who was trapped in a building in Market Street, Aberdeen, Aberdeenshire, Scotland, which was about to collapse. She was awarded another 5 medals during World War 2 for her actions as a Civil Defence senior fireguard. During this time she was a mum bringing up young children and worked as a hairdresser. Born in Aberdeen, Scotland on August 26, 1911, Marion died in Toronto, Ontario on August 14, 1993. Below is part of Marion�s life story, taken from her Memoirs surrounding her WWII years. Marion moved from Aberdeen to Toronto, Ontario, Canada with her family at the age of eight years old. She married Guthrie Armour Patterson from Dundee, Scotland on August 16, 1930. Their son Douglas was born October 8, 1932 and they lived in Toronto, where Marion worked as a hairdresser until August of 1939. War broke out shortly after moving back to Aberdeen, Scotland in 1939, and Marion enlisted as an ambulance driver. She really enjoyed her job and attended classes when not on duty to become more proficient in her work. She became a lifetime member of the Order of the Eastern Star and belonged to the White Shrine. Marion was Queen in the order of the White Shrine for two years and was also Prelate in the Order of the Amaranth for a number of years. In the summer of 1942, an emergency bulletin was issued, �All Canadian children and parents wishing to return to Canada, should apply to a steamship office in Glasgow�. Marion did not think the War would last very long, but, the thought of taking Douglas to the shelter every night, effects on his schooling and his health, made her decide to send him to her mother in Toronto. She wanted to stay with the ambulance service until the War was over so that she and her husband could return to Toronto together. The next day, two Red Cross ships carrying Canadian children and 200 wounded, were torpedoed in the Glasgow harbour. Her son Douglas was not injured. The damaged ships returned to Glasgow for 10 days for repair and eventually made their way safely to Toronto. At that time, the routine was for German bombers to land in Ireland to be refuelled, and on their way back to Germany, they would bomb London and any ships on route. It was a well-known fact that the Irish wanted to be rid of England and wanted freedom from British rule. The Irish believed that the Germans would win the war. The War raged on, the damage to Aberdeen was indescribable and times were bleak. Marion decided to open her own Hairdressing salon, which had been a dream of hers for many years. She did this with enthusiasm and was very happy to be working at hairdressing again after such a long while. Marion wanted to contribute in some way and in October of 1942, became a Senior Fire Guard for the Civil Defence in Aberdeen, Scotland. One day, while on duty, Marion was using a stirrup pump to extinguish a burning building on South Market Street, when she heard cries for help coming from the building. With stirrup pump in hand, she could see a way to start burrowing under some walls that had collapsed. It took quite some time, but she managed to get to the sailor who was trapped below. Unfortunately, his legs were trapped under some timber beams and Marion could not free him. He was too weak to help. She looked around and found some loose pieces of wood and by pushing on the loose pieces, had enough leverage to partially lift the timber. At that point, the sailor was able to wiggle himself loose. Marion kept calling above for help and finally a rope was lowered through the damaged walls. She was able to tie the rope around the sailor�s waist and with help got him out of the burning building. They were both exhausted, but safe. One minute after escaping from the building, it collapsed. The incident was written up in the London Gazzette on December 4, 1942. Marion was invited to attend at Buckingham Palace on the 12th of February 1943 to receive a presentation of the George Medal by King George VI. During the presentation, it was announced that Marion was the first street Fire Guard to win a medal while engaged in fire duties. As part of the award, Marion was also selected for portraiture in a special section of the National Gallery of England set aside for heroes and heroines of the blitz. She was also invited to be a guest at Balmoral Castle so as to be able to visit at any time she wished, for the remainder of her life. The famous Scots Artist, Mr. Robert Sivell, R.S.A. had been commissioned by King George VI to paint Marion�s portrait. Mr. Sivell worked at the Aberdeen College of Art and Marion was scheduled to meet with him for several sittings. Marion kept the portrait a secret from her family because it came as such a surprise to her; she wanted it to be a big surprise to them too. She was able to dash away from her hairdressing shop to attend special sittings for the portrait. When it was finally completed, Marion again attended Buckingham Place for the presentation. The original painting was hung in the National Gallery, London, England and was shown in a Special Wing for Heroes and Heroines of the 1939-1945 War. Her portrait had the honour of hanging between General Eisenhower and General Montgomery. Two replicas were also created and a sketch in black and white. One replica is in the Ottawa, Ontario War Museum in Canada and was part of the Women at War Display in 1985. The black and white sketch was sent to the Gallery in Aberdeen, Scotland. Just under 40 women in UK were awarded the UK George Medal. Marion was awarded another 5 medals during WWII for her actions as a Civil Defence Senior Fire Guard. Her medals are on display at the Aberdeen Art Gallery having been purchased in 2005 by the Aberdeen City Council and the Friends of Aberdeen Art Gallery and Museums. They form part of the Artists at War display. Marion moved back to Toronto after the war where she worked as a hairdresser and lived with her family until her death. She enjoyed traveling and was able to make many trips to Scotland and England. She faced many challenges throughout her life during and after the war, including breast cancer in 1975, which she also battled and conquered. She had three grandchildren, five great grandchildren, and four great-great grandchildren. 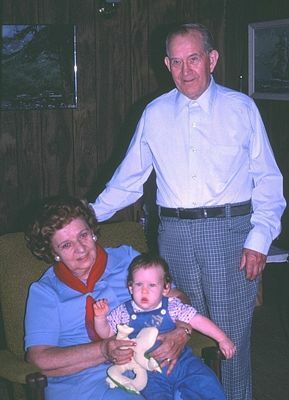 She is shown below in August of 1982 with husband Guthrie and great grandson Darryl James Wannamaker. Her grand-daughter, Skye Wannamaker, is happy to hear from anyone wishing to know more about Marion. Please contact AboutAberdeen and we shall pass on your details.